On Friday, February 28th, Family Tree DNA is sponsoring a free webinar to compliment their new Big Y product release. The webinar announcement and registration as provided by Family Tree DNA. 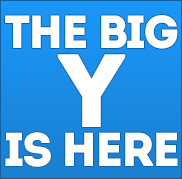 Elise Friedman has kindly agreed to do an introduction webinar on BIG Y results this Friday. Here are the details. On Friday, February 28, 2014, Family Tree DNA will release the first set of Big Y results! This webinar will provide an overview of the Big Y product, as well as demonstrate and explain the Big Y results page in myFTDNA. The webinar will be recorded, so if you cannot attend live, you’ll be able to view the recording instead. Recordings are typically available within 24 hours of the live presentation. This entry was posted in Big Y, Education, Y DNA and tagged Historical or Obsolete by Roberta Estes. Bookmark the permalink.